In the early 1970’s, Vestavia Hills High School was established when the community decided to break away from Berry High School. The seniors were given the opportunity to decide whether or not they wanted to attend the new school or remain at Berry. 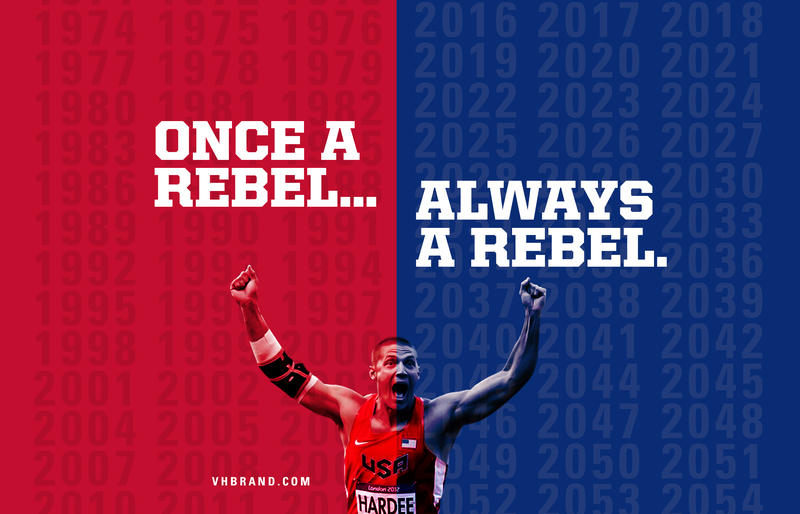 Those that decided to leave and start the new school deemed themselves as “Rebels,” the beginning of a legacy that still remains prevalent in the brand of Vestavia Hills High School. As generations have passed through the school, the students have developed a reputation for excellence, hard work, community service and unity. While these values and traditions remain constant, the visual identity of the school has evolved. With a renewed focus on the importance of a clear and consistent brand identity, Vestavia Hills High School now showcases an all-encompassing brand package with visuals that are universally applicable and appropriately represent all audiences associated with the school in a relevant, authentic and meaningful way. 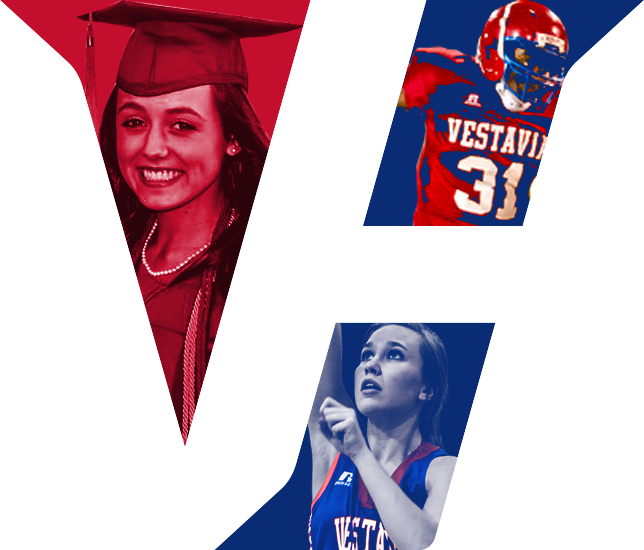 The brand of Vestavia Hills High School is not limited to a logo or an image. The elements that define the brand identity of Vestavia Hills High School work cohesively to represent all of the unique attributes of the brand. 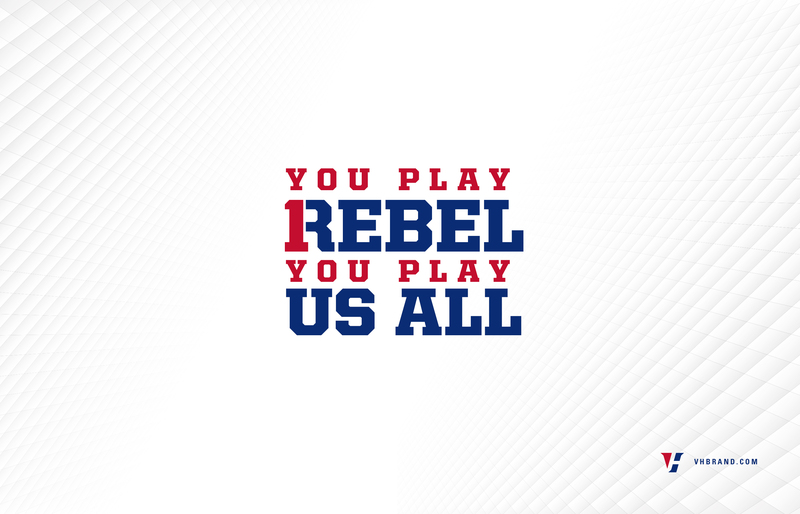 From the word choice, color choice, typography, graphics and imagery, each component plays an integral role in shaping the distinctiveness of Vestavia Hills High School and the persona of a Vestavia Hills High School Rebel. 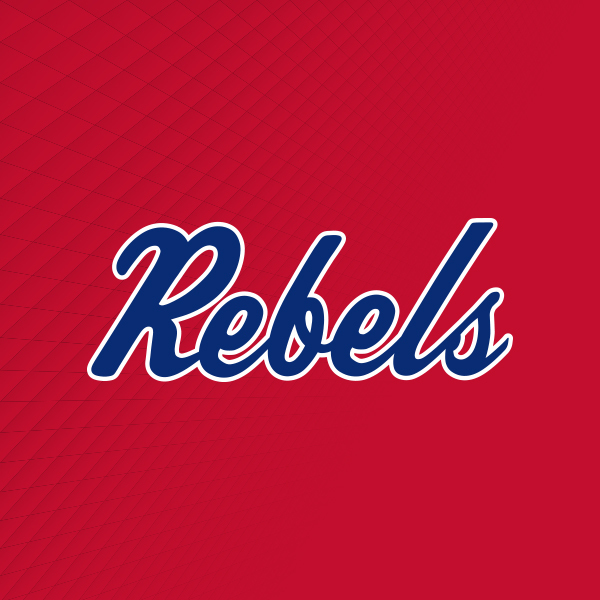 With consistent, relevant and detailed assets, the brand of Vestavia Hills High School can take shape across all mediums so that it may adequately represent the holistic brand story and express the values of a true Vestavia Hills High School Rebel. 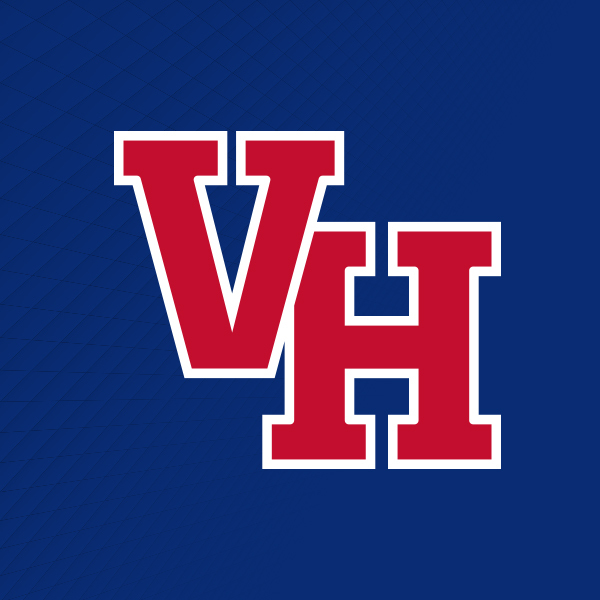 The updated Vestavia Hills High School brand identity honors the school’s tradition and core values while integrating a modern edge that positions the brand for the future. These marks are designed to propel the brand forward and provide strength and power that resonates with both internal and external audiences. Through abundant research the brand story was unveiled. With first-class creative talent and strategic planning the new imagery revolutionizes an iconic brand into a complete, consistent brand identity. The brand attributes are the values and characteristics that represent the essence of the brand. These principles served as a filter for the creative process when creating the brand imagery. 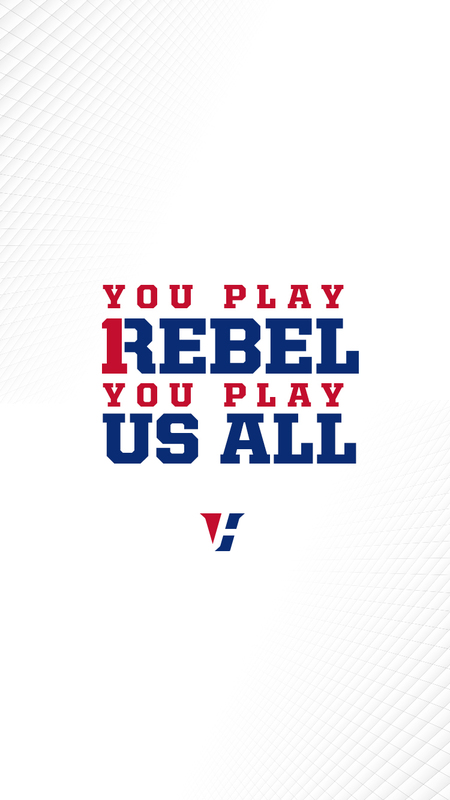 These are the prominent ideals of the Vestavia Hills High School Rebel brand: Tradition, Leadership, Unity, Pride, Service, Teamwork, Excellence, Academics, Athletics, Commitment, Courage, Togetherness, Community, Compassion. 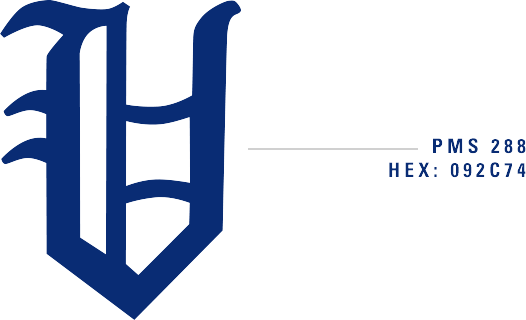 The following core elements including the primary and secondary logos, colors, typeface and brand expressions are the visual tools used to represent the true values and characteristics of the Vestavia Hills High School brand. These tools are designed to be flexible to allow creativity and individuality as to appropriately represent each of the distinct organizations, groups and individuals that make up the brand. 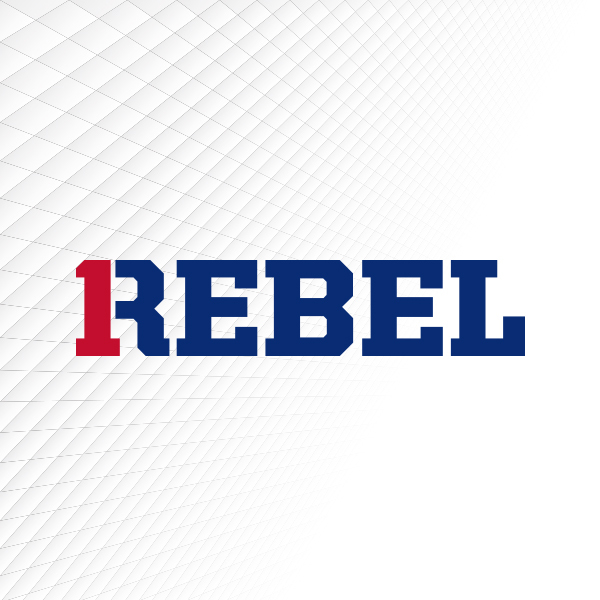 However, to effectively represent the essence of a Vestavia Hills High School Rebel and protect the brand experience, these core elements must align and maintain consistency. The following sections provide creative guidance on the use of each of the brand elements. With appropriate use, each of these elements can be used to scale the reach of the Vestavia Hills High School in a way that is effective and recognizable. The brand identity of Vestavia Hills High School supports the ideals of tradition, excellence, service and achievement. While the traditions of Vestavia Hills High School served as the basis for the values and ideals of the school, over time logos and verbiage that represent the school have evolved. 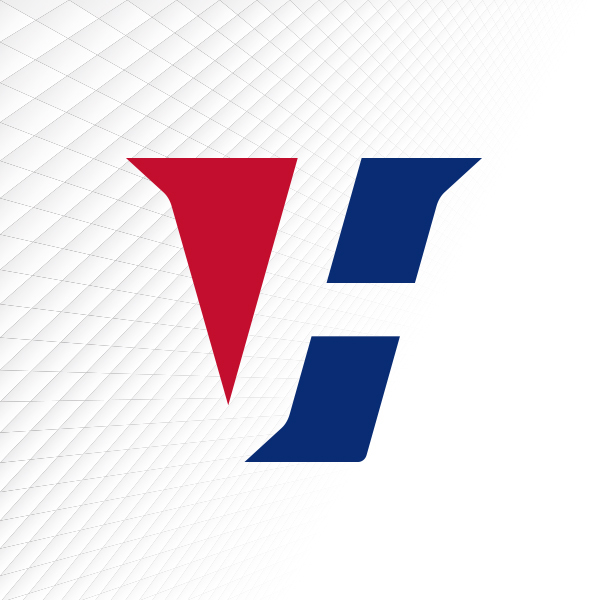 The new institutional logo propels Vestavia Hills High School forward into the modern era with a mark that represents innovation, forward thinking and learning without limits. 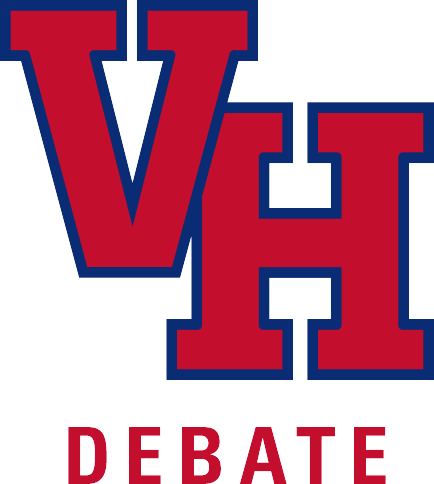 The logo serves as the primary mark of Vestavia Hills High School in any capacity. The mark should be used as the main identifying device in all institution related activities. The mark is not limited for use solely an educational capacity, and it can be adopted for use by school affiliated clubs, organizations, groups, athletic teams, etc. The Vestavia Hills High School seal is a part of the school’s heritage and is used for the most official school communications. This mark is reserved for formal documents or messages from the school. At Vestavia Hills High School, excellence and tradition are two common themes shared by the students, faculty, staff and community. The activities mark gives a nod at the iconic lettering of varsity athletics and is deeply rooted in the marks historically used by the school. This version is built on a strong foundation of the equity that has developed from decades of achievement in not just athletics but all school sponsored organizations. Subtle refinements to the mark have been made to define the geometry, scale and color to ensure consistency with use. The overall proportions of the letterform have been slightly adjusted from the previously used versions, with a decreased weight of the body (vertical) stroke and increased weight of the cross (horizontal) strokes. The connections between the strokes have evolved which features subtly curved joints. 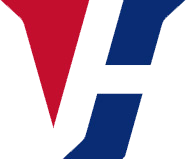 The interlocking VH logo is used as the primary mark for all Vestavia Hills High School affiliated organizations. The concept is not limited to just athletics but designed for all groups, clubs, teams, etc. The Old English V is a mark with strong historical ties to Vestavia Hills baseball. The mark was first established in connection to the baseball team under the leadership of Hall of Fame head coach, the late Sammy Dunn. The mark has become an iconic part of the baseball team’s history, which won nine Class 6A titles under the legendary Coach Dunn from 1991-2000. The mark is an important part of the team’s brand moving forward and may be adopted by other sports teams as well. 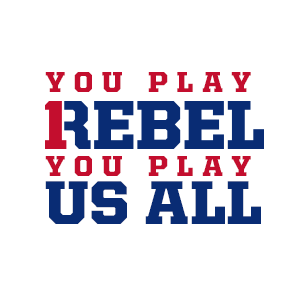 The 1REBEL slogan and 1REBEL mark by itself are additional graphic identities of Vestavia Hills High School and all Vestavia Hills High School affiliated teams or organizations. 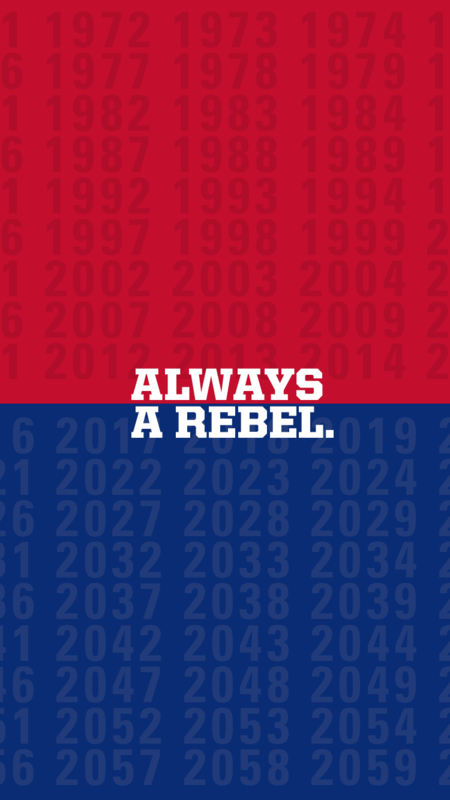 The full mark is a tribute to the legendary head football coach, Buddy Anderson’s famous saying, “When you play one Rebel, you play us all.” This saying has become an iconic message for all Vestavia Hills High School students, faculty, staff and alumni and has long been used by the school with pride. The concept speaks to the school’s longstanding reputation as united, supportive and spirited. This mark or the 1REBEL mark by itself can be used by any individual or group associated with the school. Primarily used in baseball and softball, the script work marks are created to give a nod to the heritage of these sports. The stroke is fluid and italicized, which maintains the established look, while the elongated cursive type provides a modern feel. These traditional marks are designed for use with the baseball and softball teams, and typically would not be used for other school teams or organizations unaffiliated with these sports. Type is an important element in the brand story and is a strong brand identifier. To maintain a consistent appearance across a wide variety of academic, athletic and all school related communications, a full alphabet and custom word marks have been designed to enhance the overall brand. The typefaces are designed to co-exist under the overarching Vestavia Hills High School brand but provide enough differentiation to appropriately represent each of the various facets of the school such as academics, athletics, fine arts, school sponsored events and organizations, and other extra-curricular activities. The Galliard font is used in association with the institutional logo for the school. 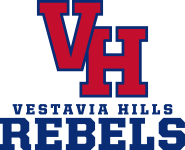 The serif typeface was established in the 1970’s, the same decade that Vestavia Hills High School was created. The robust strokes of the font in conjunction with the sharp details provide a distinct attractiveness that is different from traditional serif fonts but maintains a conventional look and feel. The Galliard typeface has been used by Ivy League institutions in the past, such as Yale, before those institutions developed fonts of their own. The typeface represents the high educational standards of Vestavia Hills High School and the school’s commitment to excellence across all platforms. The typeface enhances the primary mark of Vestavia Hills High School with a notable and clear text. The United Serif font provides a traditional varsity athletics look, which ties in to Vestavia’s rich history in athletics and extra-curricular activities. The hardworking and resilient nature of Vestavia Hills High School students, faculty, staff and alumni is signified by the bold, strong typography. The United Serif font complements the educational look of the Galliard font to maintain a traditional look and appropriately represent athletics, fine arts and other extra-curricular actives associated with the school. The sans serif version of the Univers font family was selected as the secondary identity to provide a complement to the primary athletic typeface. This secondary font is for use in lock-ups, headlines or to customize the primary marks for specific sports or school affiliated organizations. Full lockups allow the various athletic teams or extra-curricular organizations to develop their own identity under the main Vestavia Hills High School brand. The lockups help promote unity and maintain consistency across all Vestavia Hills High School teams or organizations by sharing a common appearance and hierarchy. Each organization benefits from being a part of Vestavia Hills High School.